Team CyanogenMod started slowly a few years ago, not knowing they will become one of the most appreciated and most downloaded Custom ROMs for Android in the world. 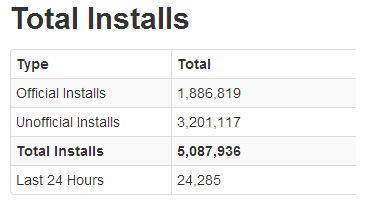 According to their official stats page, the aftermarket ROM was installed on 5.087.936 devices worldwide, and still counting. You will see that the official installs counter says 1.886.819 million downloads and the unofficial says 3.201.117 million downloads. Of course, these figures do not include all the Custom ROMs that were created with CM as base ROM. This would definitely rise the bar to another 5 million downloads. The number 1 ROM based on downloads is the Nighlty10 version and the number 2 is the Nightly 7. So people are really interested in the nightly versions of the ROM, that if you don’t know are released on a daily basis with new updates. The device with the most installs is the first Galaxy device, the Galaxy S with 236.604 downloads followed closely by its younger brother, the S2 with 194.324. The latest version of the ROM runs on Android 4.2.2 and it’s part of the Release Candidate category. This is supposed to be the most stable version of it, possibily being the last release of the 10.1 series. You can install CM 10.1 RC2 on your device, if it is supported by the team of course. If you are thinking now that CM is the most popular and most downloaded Custom ROM in the world, well you are actually mistaking as there is another one, MIUI, that has reached the 10 million mark. This one is more popular with the Asian population and also comes pre-installed as ROM on Xiamoi MI2 device. Still, CyanogenMod is really the starting point for most of the ROMs, so for us, it is the number 1 Custom ROM out there.